As you begin to lift your body from Step 10 (small image, left), exhale. 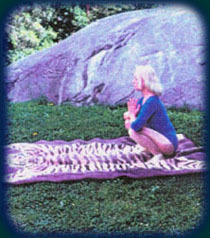 Inhale slowly as you lift your face, hands and arms up and back, as Eugenia demonstrates (larger image, left). This Step is not repeated in this series. Sit back on your buttocks between your heels, if possible. Elbows are slightly bent as Eugenia shows here. If this is easy, try to point your toes out to the sides as Eugenia demonstrates in the image above. If this is too difficult, just sit with your feet under your buttocks. If that is too difficult, just stand up on your knees and do the best you can. This is not a contest. Do what you can and be happy with that! As you sit up into what is commonly called The Natural Pose with your feet slightly apart and the soles of your feet grounded (or standing on your toes if it is impossible to get your feet flat). This Step is not repeated in this series. You can use your hands to help you into this position. Keep your back straight, even if it is slightly leaning forward for balance. Look at Eugenia's back in the image above. The small of her back is straight. Hold the palms of your hands together in front of your chest with your elbows resting on your knees (this also helps the balance for this posture). Lift your back up. Keep your neck and head straight. Feel the stretch and relax your mind and body. Get ready for Step #13. The last two steps of The Moon Salutation (13 and 14) are next, which are the same as Steps 1 and 2 when you began this series. They are simple. Step #15 is just additional notes and variations that can be practiced. It also includes how to perform The Moon Saluation at night before going to bed, which is slightly different.